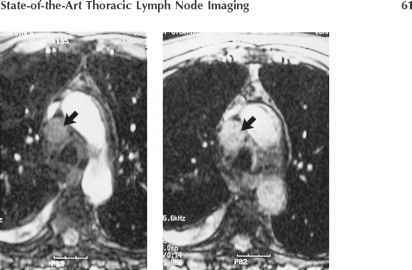 The addition of contrast agents to MR imaging provides an opportunity to characterize lymph nodes in functional terms. With regard to conventional MR contrast agents, a preliminary investigation by Laissey et al. 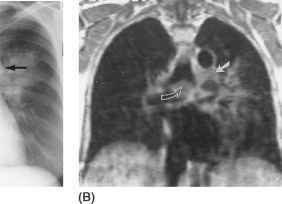 assessed the use of dynamic gadolinium-enhanced MR imaging in the assessment of mediastinal lymph nodes in patients with NSCLC. In this small series (n = 9 patients), neoplastic lymph nodes showed a peak enhancement at 60 to 80 sec, whereas benign nodes demonstrated only slight enhancement and no peak. These preliminary findings should be confirmed in a larger series of patients. More recently, there have been exciting developments in the area of novel MR contrast agents, including superparamagnetic ultrasmall iron oxide particles [3,11,19-25]. 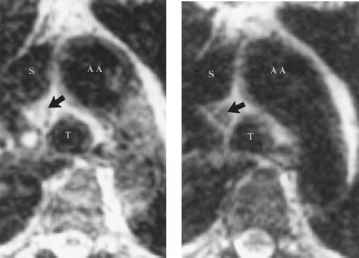 Magnetic resonance lymphography, which refers to the use of this novel agent to assess lymph nodes, involves imaging acquisition (gradient-echo and T2- and T2*-weighted sequences) before and 24 to 48 hr following intravenous administration ofultrasmall iron oxide particles [3,11]. ple, normal macrophages demonstrate avid uptake of iron oxide. Importantly, the number of functional macrophages per unit volume of tissue varies between normal and neoplastic nodes. For this reason, normal lymph nodes will demonstrate a decrease in signal intensity on T2- and T2*-weighted sequences following iron oxide administration, whereas such a decrease in signal is often absent or less marked in neoplastic nodes (Figs. 5 and 6) [3,11]. Thus, MR lymphography provides an opportunity to differentiate neoplastic and benign nodes on the basis of differing signal intensity following adminstration of iron oxide (Figs. 5 and 6). 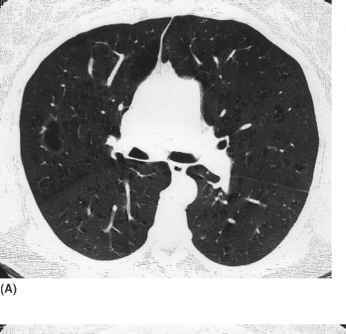 in the assessment of mediastinal lymph nodes in a cohort of NSCLC patients. These investigators found MR lymphography to be slightly more accurate than CT and slightly less accurate than PET. Although statistically significant, the differences in accuracy were quite small and considered clinically irrelevant by the investigators. Of note, this study is limited by the small number of patients (n = 9) who were imaged with all three modalities compared to a larger number (n = 64) who were imaged with both PET and CT.
Less promising results with MR lymphography were reported by Bluemke et al. . These authors performed a preliminary investigation of the role of MR lymphography in directing TBNA of mediastinal lymph nodes and reported a sensitivity of 100% and a specificity of only 38%. This study was limited by a small number of patients (n = 12) and a small number of sampled lymph nodes (n = 12). The results of ongoing multicenter trials are necessary to determine the true sensitivity and specificity of MR lymphography in the assessment of nodal status in patients with NSCLC. Hopefully, optimization of imaging parameters and contrast agent dose will result in improved sensitivity and specificity.